I envy anyone who has the ability to make beautiful tapestries under their trees and shrubs. I am fine when it is in the regular part of my garden, but now that some of my trees (like my Cercis) are starting to mature, I am struggling with painting a beautiful picture under them. When I was visiting Marion Jarvies garden in May, I found some stunning combinations that I am hoping to copy. and up close and personal. 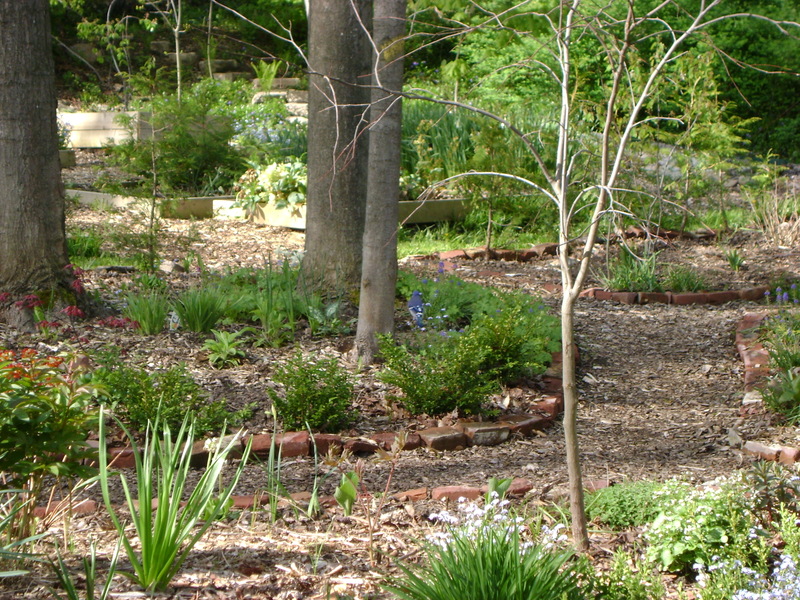 You can see that it is not the rarest or newest plants, just a lovely mix of hostas, ferns, grasses etc. But it is the combination of colours and textures that makes it so special. Some of the plants I have already, so there will be a bit of plant moving this autumn, can’t wait. hasn’t he taken a lot of abuse from me, and of course, Mother Nature, herself. 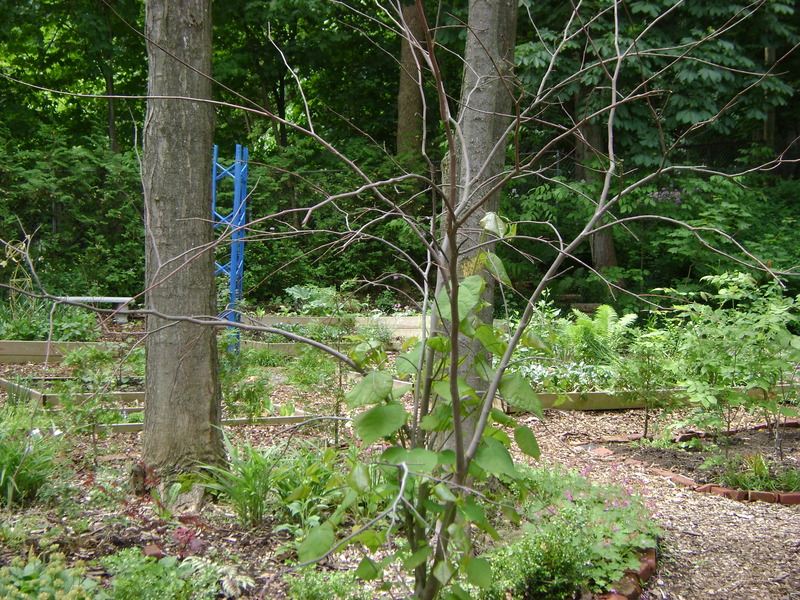 He was one of the first trees I planted at Kilbourne Grove, way back in 2007. This is the first photo I have of him flowering, May 2009. By this is a blast from the past, look at the Flora Glade, I haven’t even got the cedar hedge planted yet, or perhaps they are so small the weeds just tower over them. He came through his first two winters beautifully, but the third was a bit hard on him. When he didn’t flower, I was worried, but when he didn’t leaf out, I was very worried. Finally he started developing leaf buds, but they were from the main trunk, and quite low down. The leaf buds turned into long whippy branches, but the leader did nothing. So I finally cut it out. 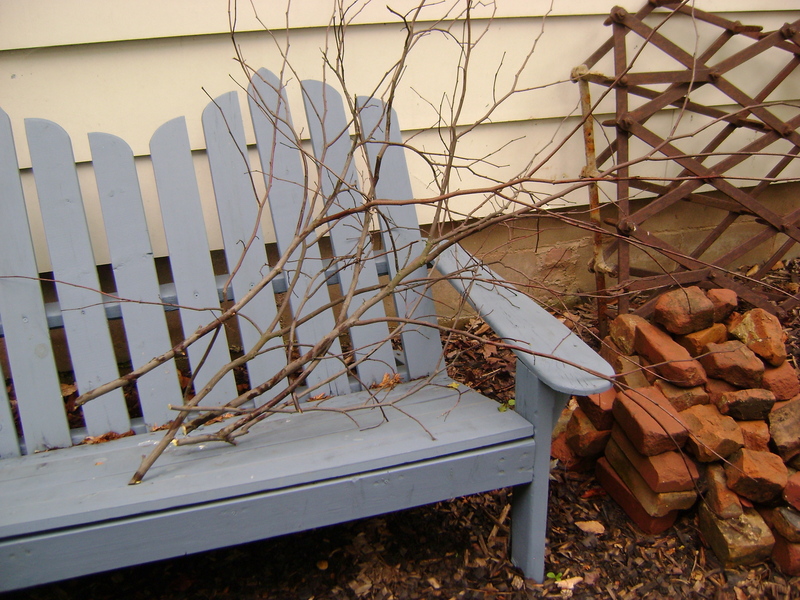 The next summer, those long branches, just got longer and longer, they were practically touching the ground, and it was showing no sign off branching, so I decided to take the ends off, in hopes that it would force some of the dormant leaf buds to spring into action. and hopefully soon you won’t be able to see the place where the amputation took place. But if you are looking for it, follow the line of the garage from the top of the wheel barrow to the Cercis, this is the spot! This, in my humble opinion, is a perfect view. I could look at this spot forever. Wish it was outside my kitchen window instead of the Deliverance house, I would be happy to wash dishes forever. It is at the Toronto Botanical Gardens, nestled in between the buildings. Cercis canadensis, both red and alba, along with narcissus and a beautiful waterfall. I believe this Acer is ‘Waterfall’, perfect in form and name here. I’m bittersweet, (my feelings that is). 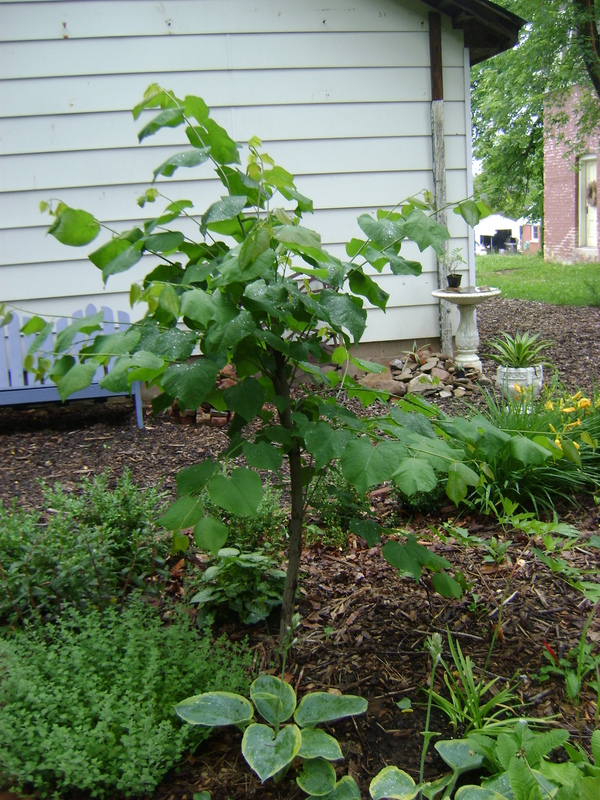 One of my first kids was a Cercis canadensis. I have had him for three years now, every year he is more glorious than the last. May came, and yet no blooms. “Odd” I thought. But then no leaves, he just sat there, looking dead. But then finally, something started to happen. The leaf buds started swelling, (I was very worried). But wait, what was this, they were coming from the trunk, not the branches. I am glad (sorry) to learn that I am not the only one. 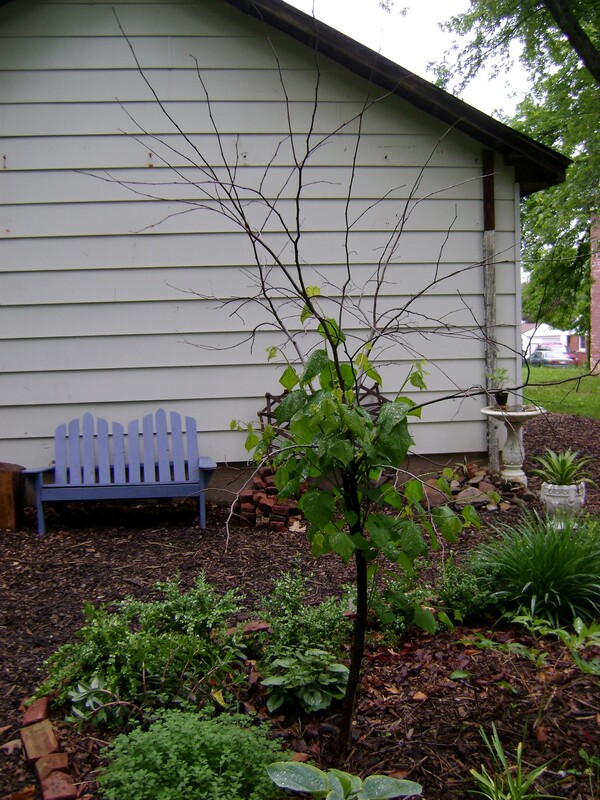 Linda from Each Little World, had the same problem with her Cercis canadensis ‘Forest Pansy’. At least mine, is the old cheap one!. In her post, Linda recommends waiting until after the fourth of July to see how much growth will come back. Being a true Canadian, I thought I would pick Canada Day, July 1st. You can see how much new growth there is. I gave him a prune. Ahhh, a haircut makes all the difference. 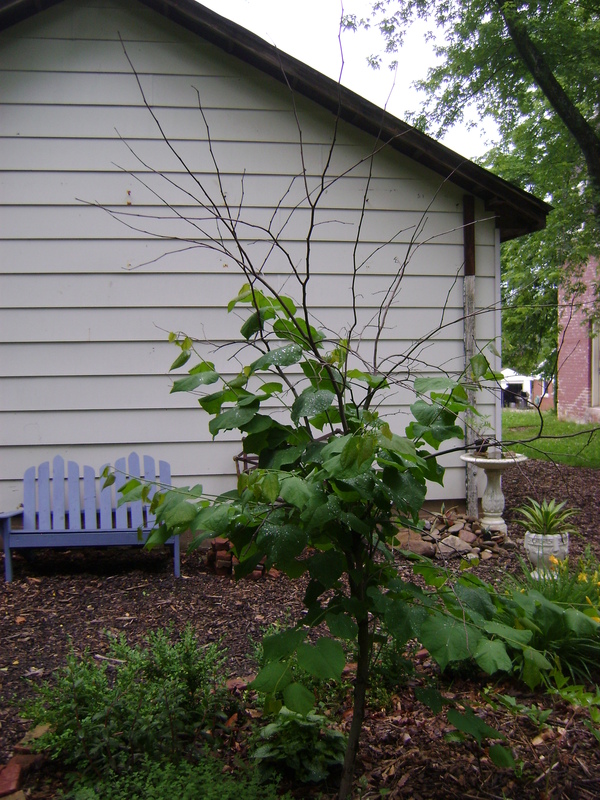 If you would like to see how Linda’s Cercis turned out, please visit her here.